This gorgeous Professional Size Double 12 Mexican Train Tiles with ColoredDots has the finest details and highest quality you will find anywhere!Professional Size Double 12 Mexican Train Tiles with Colored Dots is trulyremarkable. 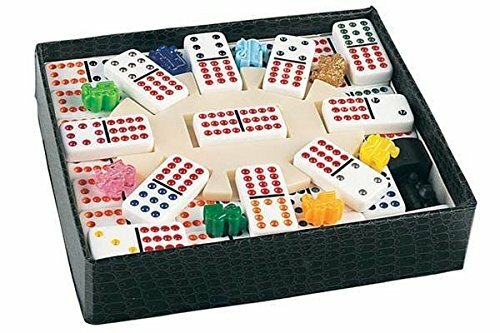 Professional Size Double 12 Mexican Train Tiles with Colored DotsDetails: Condition: Brand New Item SKU: SS-CQG-2529 Dimensions: H: 2.13 x W:7.5 x D: 8.88 (Inches) More Information: Double 12 Professional Tile withColor Dot and White Tile. Comes with 91 Tiles, A Hub, 8 Train Markers, andWhistling Train.